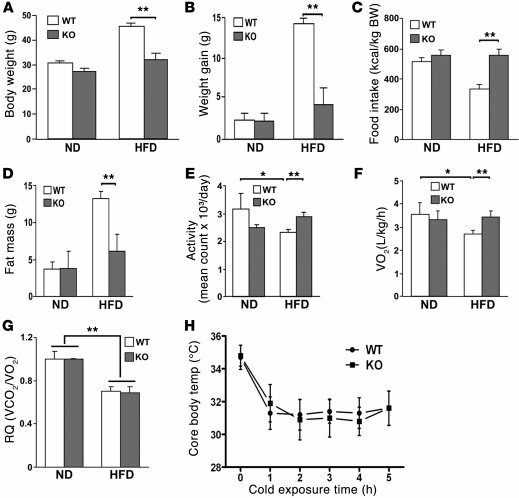 Parkin–/– mice (KO) are resistant to HFD-induced weight gain and have preserved activity and oxygen consumption. 12-week-old male mice were fed a ND or a HFD. BW (A) and weight gain (B) measured after 6.5 weeks of the ND compared with the HFD. (C) Daily food intake (kcal/kg BW) was measured for 3 days while mice were housed in a metabolic chamber. The mice were fed a ND or a HFD for 5 weeks prior to analysis. (D) Total body fat mass was analyzed by NMR spectroscopy. (E) Daily total movement counted by DSI telemetry system and averaged over 3 days. (F) Total metabolic rate (O2 consumption) monitored by Oxymax system for 24 hours. VO2, volume of O2 consumed. (G) Respiratory quotient (RQ) measured for 24 hours. VCO2, volume of CO2 consumed. (H) Core body temperature response to a hypothermia challenge (4°C for 5 hours). Data are expressed as mean ± SD (n = 5–9 per group). *P < 0.05; **P < 0.01, compared with the corresponding controls.